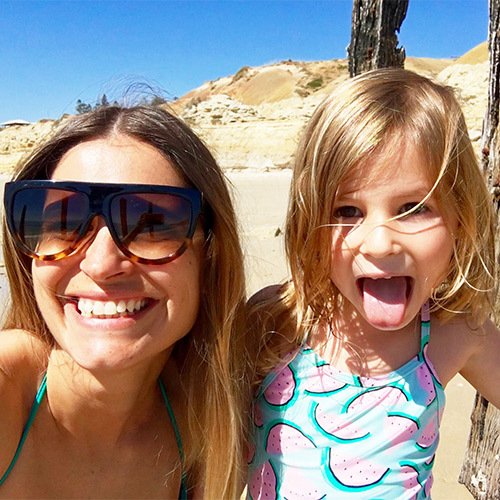 It kinda feels like EVERYONE is in Spain/Greece/France/Portugal at the moment, or at least it looks that way on Instagram! 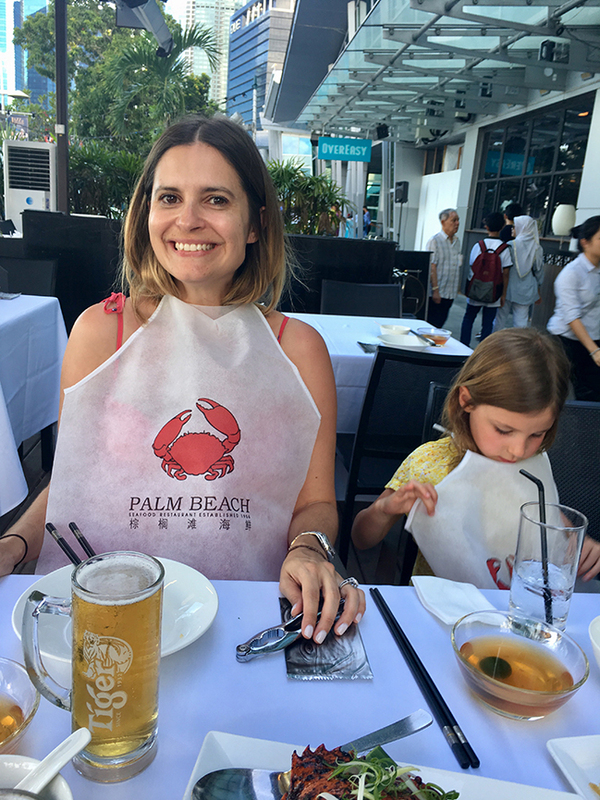 If you are in one of the aforementioned fab locations, you will have to come home at some point, and perhaps you’ll be stopping off in Singapore? Or maybe you’re thinking of Singapore as a destination for the next school holidays? 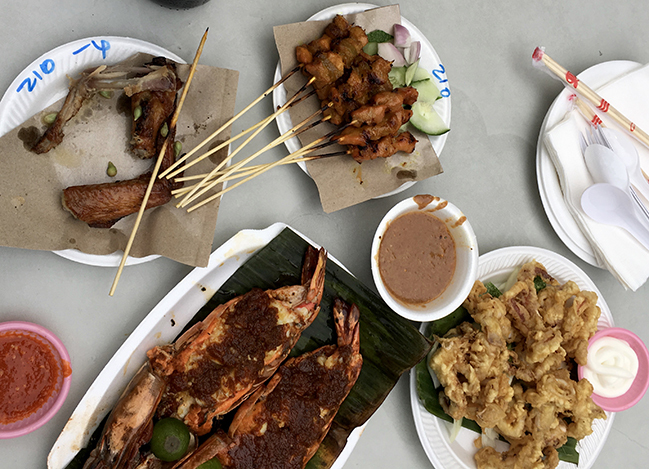 Either way, here are some pointers for eating well in Singapore… food for thought! Everyone says Newton Circus food centre is very touristy, but I think the variety is great, and it’s clean, and you’ll never get sick eating anything there…all the stores have pics of what they serve, and price wise, it’s all very competitive. 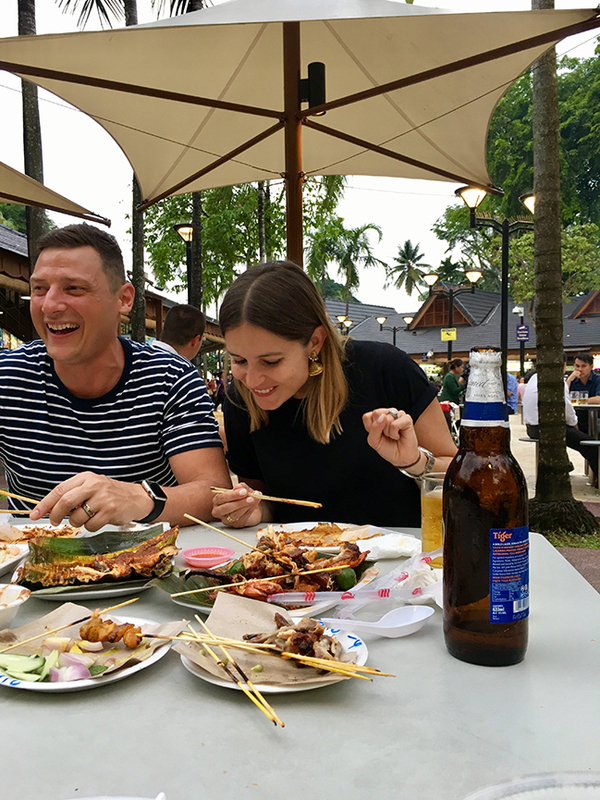 Make sure to try sambal stingray, bbq chicken wings, satay are always a winner with a nice cold tiger beer…and actually all the bbq seafood is tremendous! 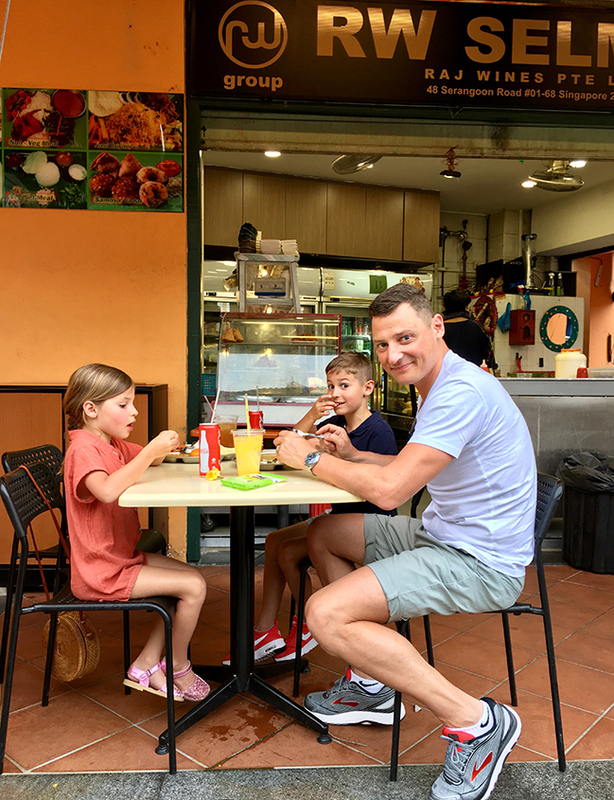 The Maxwell Road Hawker centre is another winner, and is home to Tian Tian Chicken Rice, voted Singapore’s best. Food courts in shopping centres are excellent! Stand outs for me include Food Republic at Vivo City (Near Sentosa), the food court at Marina Bay Sands Casino and shopping complex, and the one in the basement of Ion Orchard Road shopping centre. Grab a table first, then take turns to survey the offerings. These 3 are air-conditioned, and very clean, and are old fashioned in their styling. 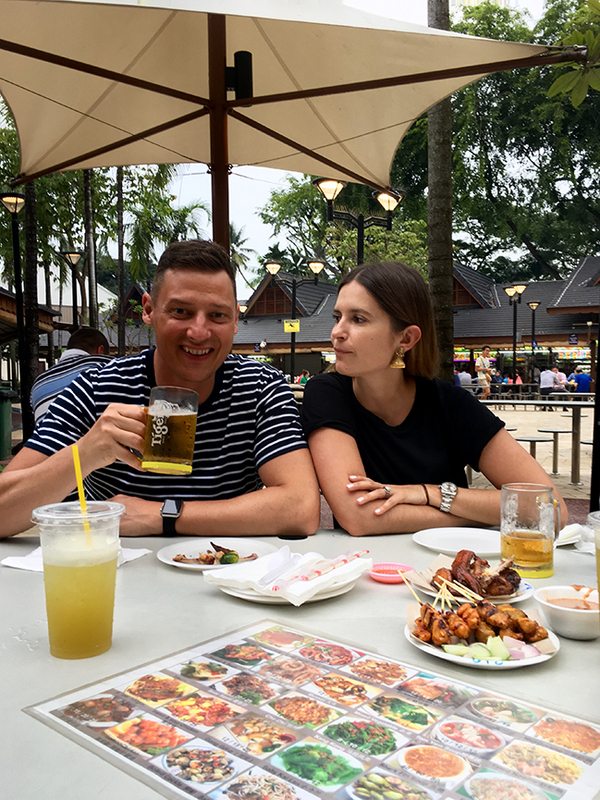 They have all the crowd pleasers…satay, chicken rice, noodle soups… bring tissues with you, and wet wipes won’t hurt either! 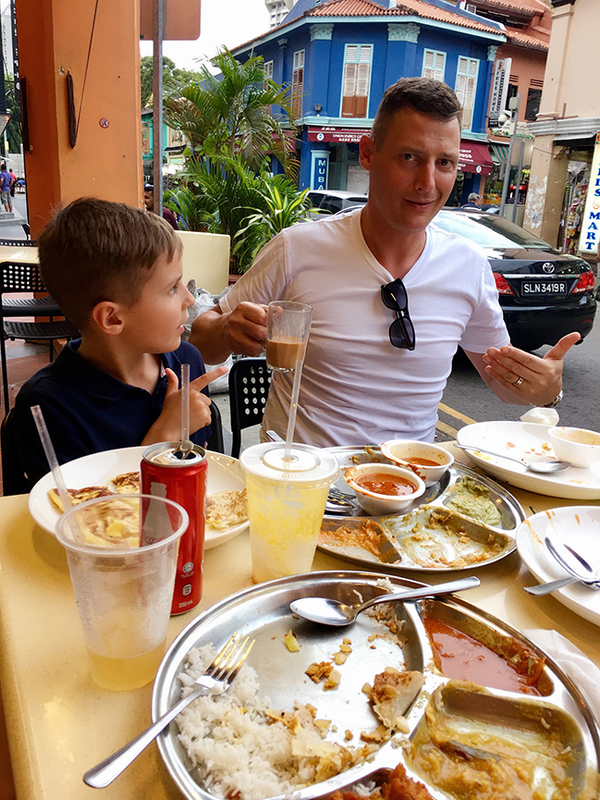 Little India is my favourite place in the world (and I think only because I haven’t had a chance to make it to India as an adult just yet!) walk around, take in the smells, and the sights, and the colours…we never really eat at the same place, we just follow our noses and see where they take us. Komala Villas from memory is an excellent place to get a Southern Indian Thali platter, and there are loads of places to have a fish head curry, and indeed roti prata…I am NUTS about egg roti myself. The Tekka markets in Little India are incredible. 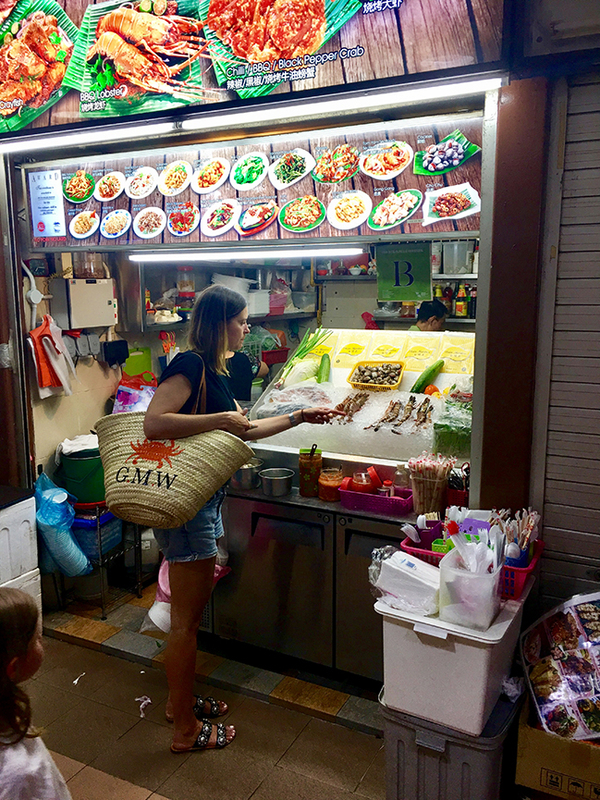 The hawker centre there is very good, and the wet markets are a sensational insight to how locals approach produce, very interesting people watching! 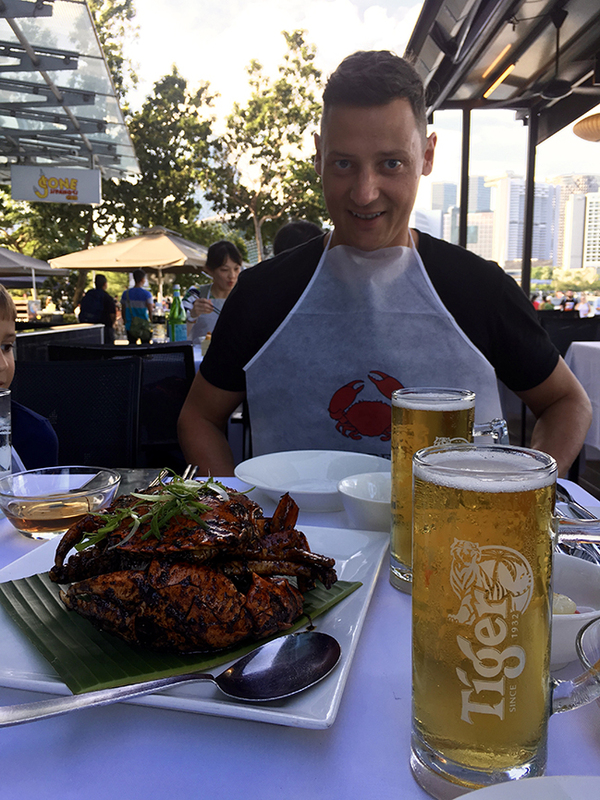 Whilst in Singapore you HAVE to try chilli crab or black pepper crab! I love the pepper variation more that the chilli one…but be warned, it’s messy! 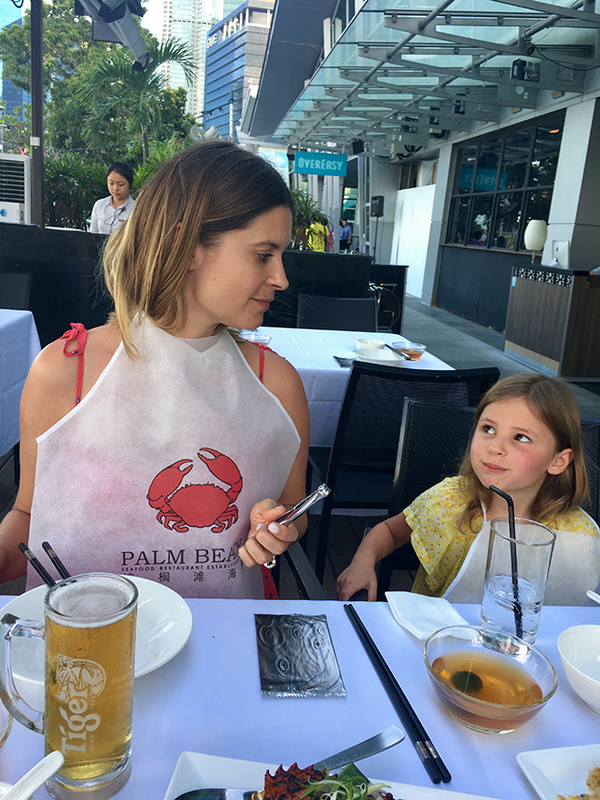 It’s great at Palm Beach Seafood, right next to the Merlion statue; excellent people watching! Otherwise, JUMBO has two central locations and is also very good. 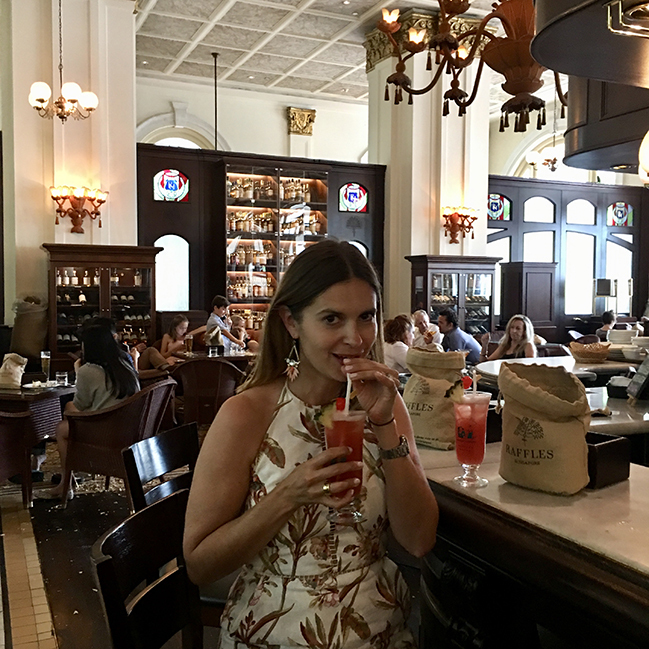 If you’re there on a Sunday, you MUST do a champagne Sunday Brunch…they are a thing of legends in Singapore…it’s a huge deal amongst expats and locals alike. Raffles do one, in the Bar and Billiard room that is extravagant, and opulent, and very special. 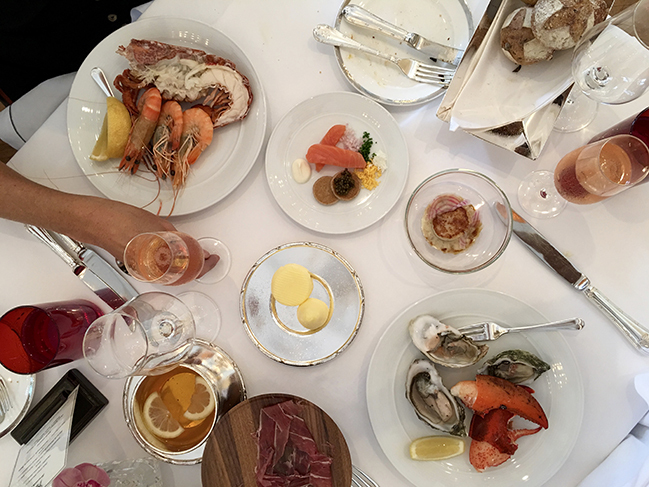 It is a beautifully curated selection of very special foods offered up with equally special champagne. Perhaps dining al fresco in the company of peacocks is more your thing? Kwee Zeen at the Sofitel Singapore Resort and Spa has you covered. This brunch buffet features more than 20 stations offering specialty foods…the desert station in particular is incredible. My advice is to TASTE EVERYTHING! Don’t die wondering! 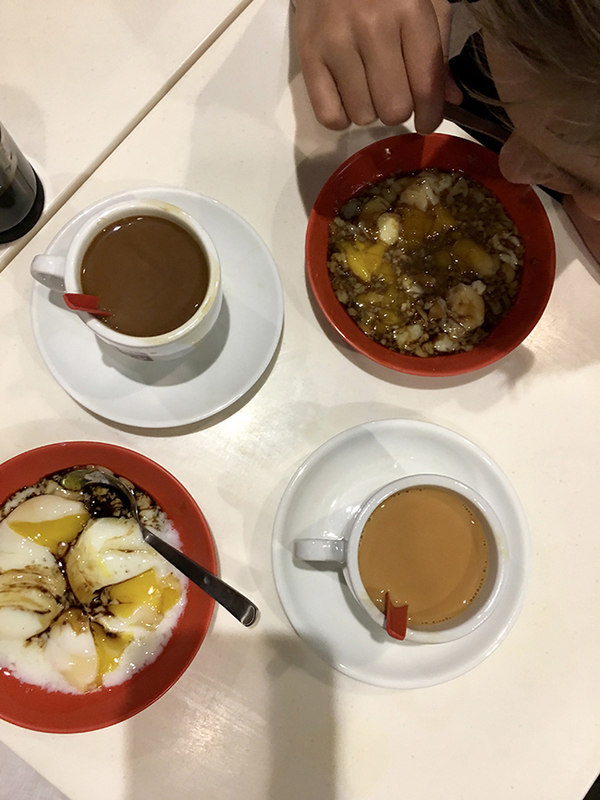 Want to eat breakfast like a local whilst in Singapore? Eat Kaya toast! Kaya is jam made from coconut milk, sugar, eggs, scented with Pandan (a fragrant almost vanilla flavour)…and is served spread on thick fluffy white toast over wedges of butter. Traditionally served with googy soft boiled eggs with soy along side a strong cup of coffee, it’s a winning sweet and savoury combination. 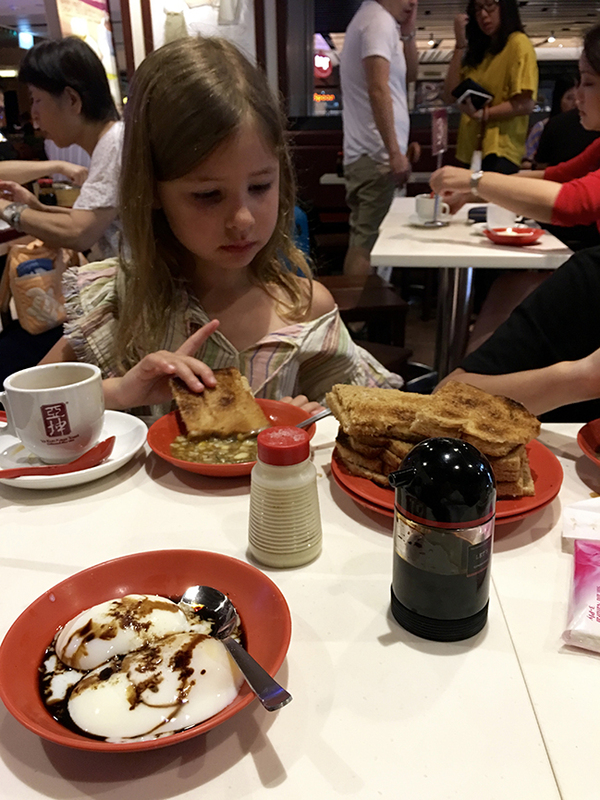 An easy place to try it is at Ya Kun Kaya Toast, a popular coffee shop chain.